After making a trip to China hoping for some cash to relieve his government from the next set of creditors banging on his door, Venezuelan President Nicolas Maduro decided to stop over in Turkey and dine at one of butcher sensation Nusret Gökçe’s Nusr-Et restaurants where he sampled steaks and smoked cigars from a personalized box. 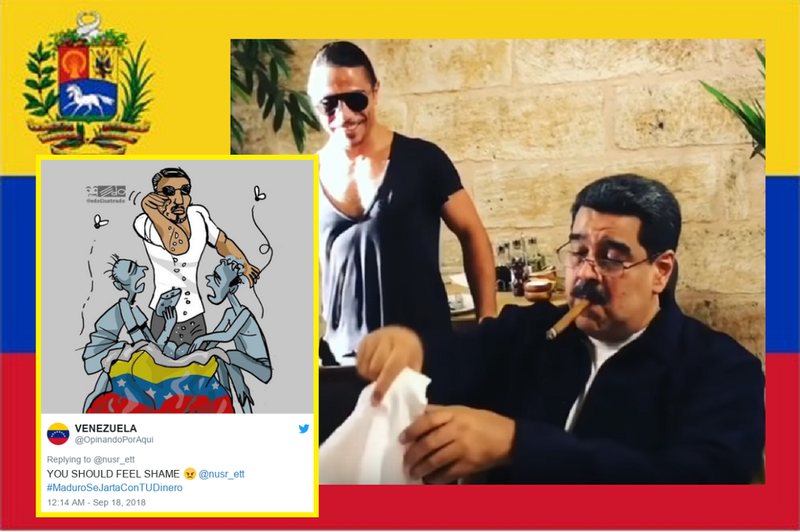 Nusr-Et, known for his throwing of salt on steaks, posted the videos of Mr Maduro’s visit rather unfortunately on social media afterwards. The Venezuelan President can be seen eating steak next to his wife, Ms Cilia Flores, while also holding a cigar and trying on a t-shirt depicting Nusret (also known as Salt Bae). The videos did not go down well in Latin America as it is known that some 87 percent of households are living in poverty while 64 percent of Venezuelans lost weight last year, 11.4 kilograms on average. Turkish Chef Ms Nusret Gokce at first happily posted three videos of Mr Maduro's visit on Instagram and youtube, but seeing the online backlash, he quickly deleted them. Many social media users have since reposted the video saying the Turkish chef should be ashamed. Venezuelan opposition leader Mr Julio Borges stated: "While Venezuelans suffer and die of hunger, Nicolás Maduro and Cilia Flores have a good time in one of the most expensive restaurants in the world, all with money stolen from the Venezuelan people."